You'll be £14.99 closer to your next £10.00 credit when you purchase The Royal Army Medical Corps in the Great War. What's this? The Royal Army Medical Corps (RAMC) supported the British Army throughout the First World War, treating sick and wounded military personnel. The military nursing services and voluntary medical personnel provided vital support to RAMC medical units and hospitals, ensuring the effective treatment of casualties. The size of the armies, the intensity of the combat, the power of modern weaponry and the global nature of conflict meant the number of casualties proved challenging for the medical services of all combatants, including the RAMC. 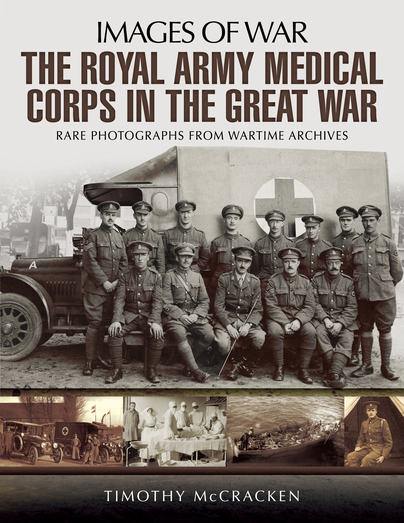 A range of previously unpublished photographs, in thematic chapters considering aspects such as service in the United Kingdom, global warfare and commemoration, illustrate experiences of RAMC and medical personnel during the First World War. unpublished group photographs of medical units, postcards and images of individuals. medical services found themselves providing care. sketches taken from unit magazines and journals, and there are postcards sent home to families. succour to the sick and wounded. As well as producing a fascinating narrative, Timothy carried out extensive research to source many photographs, some previously unpublished. Timothy McCracken's latest book is confirmation of his skill in bringing to life what otherwise might have been an academic study. He accomplishes this in a number of ways, mostly by the extensive use of a range of previously unpublished photographs. "Images Of War" shows the faces behind the abbreviation RAMC - that is the meaning of this book. This is very much a story of the people, those who made up the medical services which supported the British and Commonwealth soldiers wherever in the world they served during WW1. Timothy McCracken studied history at Lancaster University and the University of Copenhagen. He has previously researched and written Dumfriesshire in the Great War, which thematically explores cultural and social impacts of the First World War upon Dumfriesshire. Timothy has also co-authored Langholm’s Roll of Honour, which profiles casualties and decoration recipients from Langholm in the First and Second World Wars. He has written feature articles, about historical topics, for local newspapers.